Shopmobility is a service common to many towns and cities across the country. We are part of the National Federation of Shopmobility and the BHTA. We have over 30 pieces of electric and manual mobility equipment such as Mobility Scooters, wheel chairs, walking frames and related equipment for use around Preston City Centre. 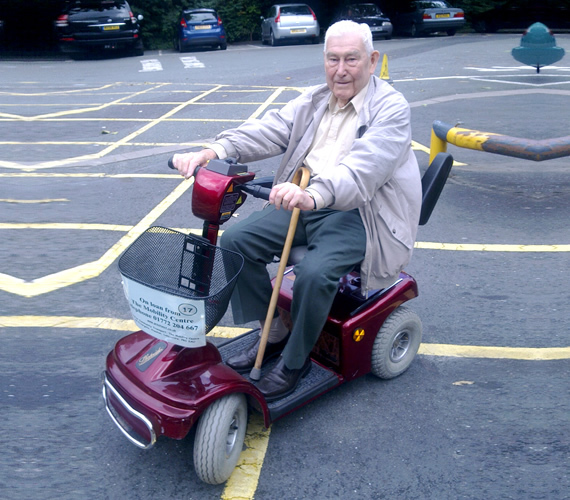 Preston Mobility Centre and the Shopmobility service are available M-F 9-4.30 Sat 10-4.30. The service is entirely staffed by volunteers so please be patient if there is a queue, thank you. The cost is £4 for any part of the day for electric equipment and £2 for manual equipment. We currently operate a reward card system so, when you have accumulated 9 stamps, your 10th hire is free. We also have a limited amount of equipment which can be hired for longer periods – please enquire at the desk. You will need to become a member to use the equipment. On your first visit, please bring with you one each from these two lists: (If you don’t have any of these, please call us to discuss). Acceptable Photo ID: Current Drivers Licence (with correct address) OR valid Passport OR Bus pass OR Valid Blue Badge. Acceptable Address ID, in your name and dated within last three months: Bank Statement / Credit Card Statement / Utility Bill / Doctors letter / Letter from government department e.g. DWP. We’ll also need your phone numbers and an emergency contact who we will ring on the day to ensure we can contact them – so please let them know that! You will be issued with a photo ID card on sign-up which you must bring with you every time you hire from us. It will expire a year from sign-up when you’ll have to renew your membership with ID again. Replacement cards costs £1. Booking is always advisable, please call on 01772 204667 and choose Option 1. If you are driving here and want a code for your satnav – use PR1 2NN. This will take you to the old Corn Exchange building on Fleet Street, once there, turn left into the pedestrian area (outside the Lune Street chip shop) and follow the black bollards into the Chapel Yard blue badge car park. This is a 24/7 blue badge car park and it is patrolled by Preston City Council’s enforcement officers. If you would like more information on the car park click here. Parking: Although we are able to reserve some spaces on the car park for Shopmobility customers and will do our best for you, as we do not own or operate the car park, please do not expect one.